The Al Jalali and Al Mirani Forts were built during the Portuguese colonial rule of Oman during the 16th Century and now are beautiful windows into that era. 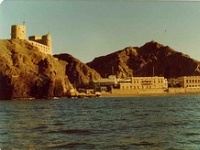 Situated on either side of a palace, they give a fortified appearance to Muscat's harbour. The forts are examples of traditional architecture, with Al Jalali bedecked with traditional doors, rugs, and pottery. Both Al Jalali and Al Mirani have ancient war memorabilia such as armour and weapons on display. Their strategic position on a mountain overlooking the harbour gives tourists commanding views of the city and Arabian Sea below. Opening times can be fickle but many undeterred tourists enjoy the scenery from outside their walls.